Do you want people to feel like they can just walk right into your paintings? That’s what I want! Knowledge and control of all the aspects of perspective is essential to accomplish this. Photographers have the benefit of “the suspension of disbelief”. In other words, when you look at a photograph, you assume that it is depicting reality. You take for granted that it is “real”, even though a photograph is just an image on a flat surface just like a painting. Paintings are not automatically given the benefit of this suspension of disbelief. 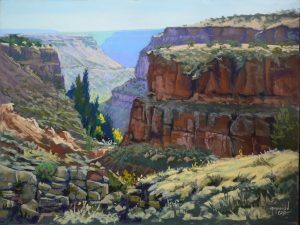 Artists must earn this acceptance if they want the viewer to be caught up the mystery and magic of representational art. 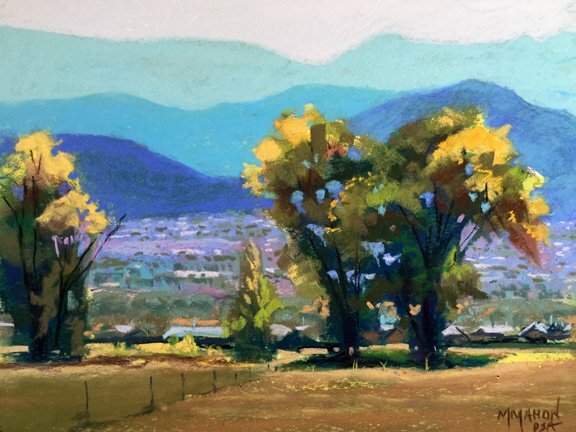 This pastel landscape video with teaching comments was painted in about 2 hours but has been edited down to about 17 minutes. 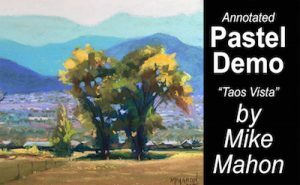 This was a demonstration painting for the Pastel Society of Southern California in Redondo Beach California this Spring. I have included all of the comments I made during the painting but have speeded up the action when possible to keep it to a easy viewing time. I painted it on Wallis sanded paper using a pastel/Gamsol wash underpainting. 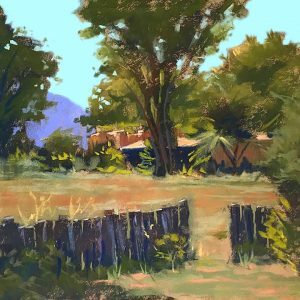 I painted it using my Pastel Porter™ll Plein Air Specialist set up. The painting in this video is a good example of using value, temperature and overlap to accentuate depth, perspective, and atmosphere. Because air filters out yellow over distance, everything becomes increasingly blue (the complement of yellow). The pronounced warmth (yellow-yellow/greens) in the foreground contrast strongly with the blues and violets of the background which tends to pull the foreground forward and push the background backward. I was careful to keep the darkest values in the foreground because the atmosphere also lightens values with distance. 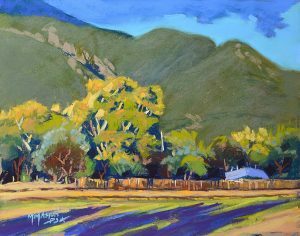 Most important of all, the trees of the foreground dramatically overlap a series of horizontal shapes which creates a strong, unambiguous sense of perspective. All of these techniques (and more) must be used and accentuated if you want to create the illusion of 3 dimensions on a 2 dimensional surface. In my workshops I teach the 7 basic principles of painting which I call the Aesthetic Categories. Perspective is studied in depth (pun intended) for obvious reasons. I will be adding more demos to this blog in the near future.